Sacred Money Archetypes Breakthrough Session! These synergistic blends are effective essential oil formulations, each one carefully designed to offer a natural support in the creation of well being. The properties of the individual essential oils in a synergy, harmoniously support each other and create a particular effect often far more powerful than the individual elements. Many address common ailments, others are primarily designed to uplift and balance the spirits. 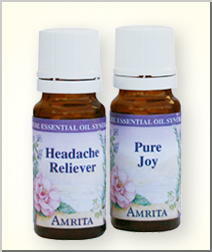 Click Here to view or download the Amrita Guide to Essential Oils and Synergy Blends. Especially helpful with hay fever and other allergic reactions including skin irritations. It may also relieve symptoms of asthma and over sensitivity of the nervous system. Amni Visnaga, Moroccan Blue Camomile, Lavender Extra, Rosewood and Hyssop. Helpful in easing anxiety. Creates feelings of protectedness, grounding, peace and confidence. Geranium, Melissa, Thyme and Juniper. Good to use in the Amrita Car Diffuser. A cheering, relaxing, soothing blend which eases the discomfort of menstruation, pms and menopause. Organic Geranium, Clary Sage, Bergamot and Roman Camomile. Refreshes, helps protect from respiratory problems in cold season, and encourages deep breathing. Citronella, Sweet Eucalyptus and Siberian Fir. A celestial sunny blend for a pure and happy heart. This blend is like sunshine - it's the best antidote for a gloomy day. This synergy has a slight phototoxic effect. It should not be used as massage oil. Bergamot, Grapefruit, Lemon, Lime, Neroli and Tangerine. Very calming, facilitates relaxation and sleep, and may be used night or day to experience relief from stress. Sweet Marjoram, Lavender Extra and Tarragon. This powerful synergistic blend of Bay Laurel, Eucalyptus, radiata; Oregano, Tea Tree, and Thyme Borneol, Red, and Thujanol contains some of the most potent immune-boosting properties available in Nature's pharmacy. Extremely useful in fending off illnesses and promoting optimal immune system function, this blend is especially beneficial during cold and flu season. Diffusion facilitates the elimination of airborne germs, diluted application along the lymphatic system assists in stimulating flow and drainage, while simply inhaling this efficacious elixir has proven effective in clearing congestion and supporting the respiratory system. Optimizes mental performance, energizes the body, clarifies the mind, and increases concentration and memory. Ginger, Lemon, Lime and Peppermint. An uplifting, relaxing blend with an aphrodisiac effect. Use it to create a happy atmosphere or to enhance a romantic occasion. Ylang Ylang, Bergamot, Lavender Extra and Pink Grapefruit. Quitting the smoking habit is supported in different ways: This blend soothes irritability and nervousness, promotes a feeling of calm, centering and peace. Grapefruit, Bitter Orange and Lime help ease cravings and detoxify. Spearmint and Black Pepper energize. Helichrysum helps release the underlying emotional imbalance. This blend also purifies the air. Combines oils extolled since ancient times for heightening spiritual awareness. Also has very relaxing and stress relieving properties. Tamil Nadu Sandalwood, Frankincense and Atlas Cedar. This is a traditional French aromatherapy blend. A variety of Lavender species and Wild Rosemary combine to produce a stress relieving yet uplifting and restorative synergy. Lavender Extra, Lavandin and Rosemary. A warming, spicy therapeutic synergistic blend of Bitter Orange, Cinnamon, Clove, Mandarine, Nutmeg, Sweet Bay, these essential oils are known for their digestive properties, increasing circulation, and mildly stimulating qualities, gently supporting the immune system. Uplifting and radiant, chases away the winter chills. Not to be applied directly to skin, useful in diffusion only. Copyright © 2005-2015 Journey To Freedom. All rights reserved.